Entitlement absent from Kennedy campaign. ATTLEBORO - Joseph P. Kennedy III arrived for his first official day on the campaign trail yesterday morning to a crush of reporters and television cameras. But the voters who met the newly minted candidate at stops across the district said that Camelot nostalgia is not enough to win their vote. “I consider myself an independent thinker; I would like to see what he has to say,’’ said city resident David Downey, 48, who met Kennedy at a lunchtime visit to Morin’s Hometown Bar & Grille. For every skeptic though, there was a longtime Kennedy supporter like Shirley Coelho, 77, who came to Morin’s just to catch sight of the new generation of the storied Massachusetts political family. After officially announcing his candidacy in a YouTube video early yesterday morning, Kennedy, the grandson of Robert F. Kennedy, spent the day crisscrossing the Fourth Congressional District. The Democrat hopes to succeed retiring US Representative Barney Frank. 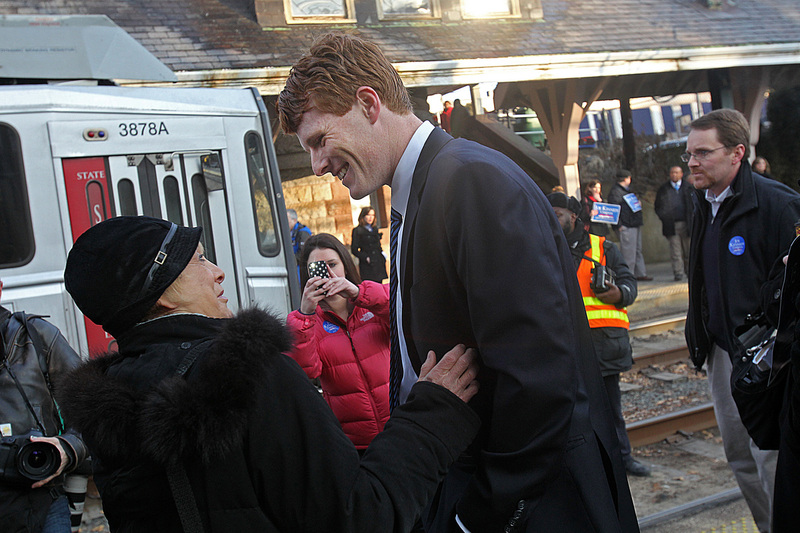 Kennedy began the day shaking hands with Green Line commuters in Newton, introduced himself to the lunch crowd at Morin’s in Attleboro and ended his day at a campaign event for the Fall River mayor. At each stop, the 31-year-old former prosecutor assured voters that he will work to earn their support. 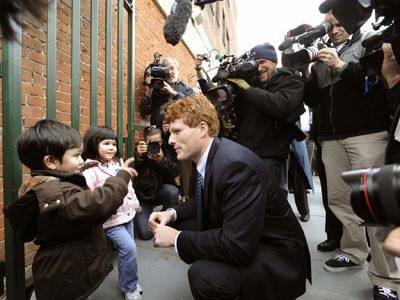 If elected, Kennedy would be the first member of his family to return to Washington since his cousin, former US representative Patrick Kennedy of Rhode Island, left the House last year. At the Attleboro diner, a swarm of reporters crowded into the tiny restaurant, rushing to surround the congressional hopeful as he introduced himself, while a television, tuned to local noon news, broadcast images of him earlier that day. Judy Erickson, a waitress at Morin’s for 10 years, held the door open as the throngs of reporters poured in. She has seen politicians make campaign appearances at Morin’s before - the diner is an Attleboro institution - but even so, yesterday’s crowd was extreme. Alice Scanlon, 60, was tucking in to her cheeseburger and french fries when she found herself face-to-face with the politician and dozens of cameras. “I heard he was coming, but I didn’t think I’d get caught in the middle of all this,’’ she said. Kennedy apologized for interrupting her lunch with all the hubbub. But Scanlon didn’t mind. “I think he would probably do a good job if he did get into office,’’ Scanlon said. Kennedy said the day provided a chance to introduce himself to the residents whose votes he’d like to capture. “For me, it’s been an absolute pleasure to . . . listen to the concerns of people in the district and to get a sense that the message I care about is one that they care about, as well,’’ Kennedy said. Barney Frank, who will retire next January, will have held the fourth district seat - which snakes from Newton through Taunton and down to sections of Fall River - for 32 years. Three other Democrats are also competing for the party’s nomination: Herb Robinson, Paul Heroux, and Jules Levine. Republicans Sean Bielat and Elizabeth Childs are also vying for the seat. In Kennedy’s three-minute video, titled simply “I’m Running,’’ he promised that, if elected, his priorities would include a fair tax code, job growth, and a 21st-century energy policy. But for Erickson, Kennedy’s appeal yesterday had nothing to do with his political views or his famous family. So, does he have her vote? ATTLEBORO - Joseph Kennedy III said Thursday he will rely on hard work rather than his famous last name to try to win over the voters of the 4th Congressional District. Kennedy toured the district to formally launch his campaign, making several stops to meet voters, including one at Morin's restaurant in downtown Attleboro. With a swam of media recording his every move and word, Kennedy said he is proud of his family's heritage of public service, but wants to win the election on his own terms. "I want to earn it. Campaigns are all about earning it," he said, explaining that he wants to outwork the competition in meeting voters, knocking on doors and taking stands that support the middle class. "I intend to earn their respect and hopefully their support," he said in a brief interview at The Sun Chronicle. Voters at Morin's said they do not know enough about Kennedy at this point to say whether they support him or not. Kennedy said he intends to meet and talk to as many voters as possible to get know them and to allow them to get to know him. He described himself as following the family tradition of being progressive on social issues such as education and health care, but "realistic" on fiscal issues such a taxes and spending. "Government, when it is done right, it can help people," but government is not working well now and more efficient ways of running it must be found, he said. The 4th district run is the first venture into politics for Kennedy, 31. Until recently he was an assistant district attorney in Middlesex County. He has also been in the Peace Corps and worked as a legal aide helping tenants keep their homes, he said. He is the son of Joseph Kennedy II, a former congressman who now provides heating oil to needy families through a charity called Citizens Oil. The candidate is also the grandson of the late U.S. Senator Robert Kennedy, and a grand nephew of the late President John Kennedy and Senator Edward Kennedy. The candidate is also the grandson of the late U.S. Sen. Robert Kennedy, and the grand nephew of the late President John Kennedy and Sen. Edward Kennedy. He is the cousin of Patrick Kennedy, the former congressman from Rhode Island. A graduate of Harvard Law School, Kennedy recently moved into the 4th District, taking an apartment in Brookline after living just outside the district in Cambridge. He said he knows critics might try to make an issue of his moving into the district, but said he has found through talking to voters that their concerns are universal. "People are hurting," he said. "They say `government is no longer working for them,'" he said. Jobs is the biggest issue and he would like to address that by creating an environment for small businesses to be created and grow, he said. Attleboro, he said, has some economic advantages, such as Sturdy Memorial Hospital, but its unemployment rate is still too high, he said. "You have a city that really knows how to work hard and wants to work hard," he said. Acknowledging that the media frenzy that accompanied him on the first day of his campaign is unlikely to last, Kennedy vowed to return to the Attleboro area many times during the campaign after the cameras have left. Kennedy is being challenged in the Democratic primary by Paul Heroux of Attleboro. At least two Republicans, Sean Bielat of Norfolk and Elizabeth Childs of Brookline, are also running for the seat being vacated by the retirement of U.S. Rep. Barney Frank, D-Newton.